After nearly 19 years of marriage, Robin and Marsha Garces Williams are getting divorced. Garces Williams filed a petition for dissolution of marriage on March 21 in San Francisco Superior Court citing irreconcilable differences. The two met when Garces Williams worked as a nanny for Williams' son Zachary, whom he had with his previous wife, Valerie Valardi. 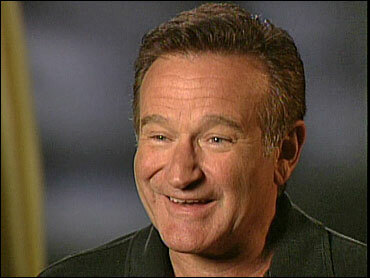 Robin Williams, 56, won an Academy Award for his role in the film "Good Will Hunting." He also starred in the sitcom "Mork & Mindy" (1978-82), and has acted in a number of movies including "Dead Poets Society" and "Patch Adams." 2Paula Abdul and Miley Cyrus are among the stars who will headline the "Today" show's 13th annual concert series. Abdul will kick off the series on the plaza outside the "Today" studio April 25, NBC announced Wednesday. She recently debuted her first new song in a decade, "Dance Like There's No Tomorrow," produced by fellow "American Idol" judge Randy Jackson. Cyrus is set to perform July 25. Other headliners include Ashlee Simpson, Rascal Flatts, Natasha Bedingfield, Neil Diamond, Mary J. Blige, Alanis Morissette, the B-52s, Donna Summer, Chris Brown, Kenny Chesney, Rihanna and Coldplay. Sheryl Crow will take the stage Aug. 1. NBC said it will announce additional acts in the coming months. 3Justin Timberlake is hosting an awards show - and it's not the Grammys. ESPN has lined up the 27-year-old singer-actor to host its annual ESPY Awards show this summer, celebrating some of the best and funniest moments in sports over the past year. The ceremony, to be held at the Nokia Theatre L.A. Live in Los Angeles on July 20, will be televised live on ESPN, the network said Wednesday. Timberlake says he's a sports junkie. "I'll do my best to deliver a great show, as I do not want to be roughed up backstage by these athletes who are bigger, faster and stronger than me," he said. Timberlake will be in the summertime movie, "The Love Guru," with Mike Myers and Jessica Alba. He recently showed a different kind of stage presence when he inducted Madonna into the Rock and Roll Hall of Fame. 4Although "Stop-Loss" star Ryan Phillippe and "Walk The Line" Academy Award winner Reese Witherspoon have spilt, it doesn't make it any easier to see each other involved in a new relationship. According to People, Phillippe said that it's "bizarre" seeing pictures of his ex wife with "Brokeback Mountain" star Jake Gyllenhaal and that he tries to avoid it, he revealed in an interview with USA Today. "There's plenty of times when I say, 'What a strange situation I've found myself in,'" Phillippe said. "But at a certain point you know it's going to happen, so you are prepared." Phillippe, 33, has two children with Witherspoon, Ava, 8, and Deacon, 4. 5While "Die Hard" actor Bruce Willis was in New York City, he had a confrontation with a paparazzo who happened to be standing in the wrong place at the wrong time. The tiny paparazzo, who was half Willis' size, was standing in the entranceway when Willis bumped into him. Willis, who appeared to be aggravated, immediately exchanged some harsh words, making the paparazzo say "That's not nice" as Willis walked away in a fury. Looking for an excuse to avoid celebrating Earth Day? "There's nothing going on nearby" is probably not going to fly. The Roots, Ricky Skaggs, Los Lonely Boys, the Neville Brothers and Mickey Hart from the Grateful Dead are among the headliners for eight simultaneous Earth Day festivals planned at major cities around the U.S. on April 20, organizers said Tuesday. The free events will be staged at parks in New York, Chicago, Dallas, Denver, Los Angeles, Miami and San Francisco. The flagship event will be the Earth Day 2008 celebration on the National Mall in Washington. In New York, country singer Ricky Skaggs will perform in Central Park, and the Latin group Menudo will take the stage in Miami with hip-hop group Arrested Development. Los Lonely Boys will be the headline act in Dallas while the Neville Brothers take their funk and R&B act to Denver. Mickey Hart is expected to perform at Golden Gate Park in San Francisco. Britney's baby sister is engaged. Sixteen-year-old Jamie Lynn Spears, who shocked the public with her pregnancy announcement, has been wearing an engagement ring from 18-year-old fiancé Casey Aldridge, People reports. A source close to the family, told the magazine that Spears has been showing off her rock to friends and family around Louisiana and Mississippi.